Drug squad officers say Asian drug gangs are making inroads on the heroin trade in Derby. Steve Holmes from the Derbyshire Police's drug trade market project says Asian dealers make up about one-third of the 200 heroin dealers in Derby. "Younger Asian lads seemed to have got involved in it now... and are competing in the open market," he said. Police intelligence says Asian criminals are expanding their operations within the city and competing with street dealers from Albania, Turkey and Jamaica. "There are a lot of cocaine dealers from Columbia because that is where the coca is grown, and it is the same for Afghanistan and Pakistan," Mr Holmes said. "That is where a lot of opium poppies grow - so it makes sense that a lot of heroin dealers are from Asia." He said: "So far we have been able to avoid a lot of violence that goes with the drug trade in other towns, but that doesn't mean there isn't violence in the drug trade as it doesn't always get reported. "We are not on a witch hunt, but we are targeting the drug dealers and watching where the drug comes from. "If we target one group, then we have to target the ones who are going to take over the patch." 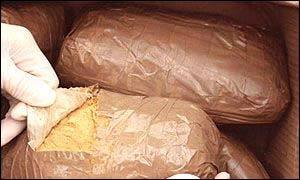 BBC's social affairs correspondent Barnie Choudhury said police information indicates that 30 tonnes of heroin enter Britain every year, but only two tonnes are seized before being sold to drug addicts. "Asian communities are becoming more violent and more organised... we have talked to an Asian drug dealer who said: 'We see the flashy cars and we want a part of it'," he said. "Drugs are a problem for every community going. "Race doesn't come into it, as it is about taking over patches and cornering a market."